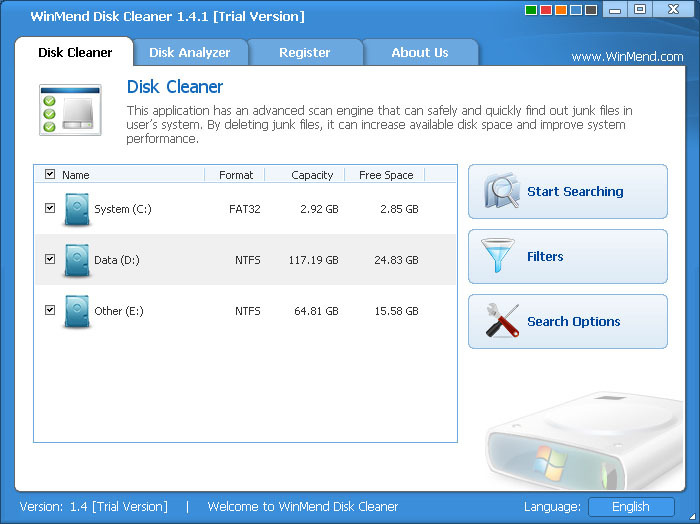 WinMend Disk Cleaner is a quick and safe junk file cleaner. With a powerful scan engine, it safely and quickly locates junk files in your system. By deleting junk files, it increases available disk space and improves system performance. You can specify the content to include or exclude in the scan and select drives to scan. The scan results will be displayed with subtotals. Its Disk Analyzer module enables you to see the types of files in charts. Qweas is providing links to WinMend Disk Cleaner 1.5.3 as a courtesy, and makes no representations regarding WinMend Disk Cleaner or any other applications or any information related thereto. Any questions, complaints or claims regarding this application WinMend Disk Cleaner 1.5.3 must be directed to the appropriate software vendor. You may click the publisher link of WinMend Disk Cleaner on the top of this page to get more details about the vendor.